Do you need a bartending license in DC? If you are in the DC area - across Maryland, VA, and Silver Spring - and you are interested in getting a bartending license, then Maryland Bartending Academy can help you become a professional bartender. A fun, exciting, and lucrative career as a bartender awaits you, but only if you achieve the proper training and instruction. If you want to read more about bartending licenses and requirements for professional bartending in DC, then this page can tell you everything you need to know. If you are ready for expert bartender training simply call 410.787.0020 or click here! Is There A DC Bartending License? No. Maryland does not actually require bartenders to obtain a "license" per se, but Maryland Bartending Academy does give out a certificate, like a license, after you complete the program. The state does, though, require an alcohol awareness program that is included in our bartender training. How does this function like a license? It lets area bars know that you are more than just another person looking for a good job; you are someone with the training and knowledge to succeed right away at the job. As a consequence our graduates, armed with their MD Bartending Academy bartender diploma, quickly find themselves in profitable jobs, making more than their counterparts. How To Get A Bartending "License"? Complete your coursework satisfactorily - which is easy and fun - and you will graduate with a certificate from MD Bartending Academy that says to employers that you are ready to jump into lucrative work as a professional bartender. Though the bartending "license" you receive is not required by state law, it is necessary to make sure you quickly earn the wages you deserve. Benefits Of Your Bartending "License"
How Long Is Bartender Training? It really depends on how much time you spend per week devoted to your bartending instruction. It typically lies in the range of two weeks. Please contact us to learn the specifics on class schedules. How Much Can You Make Bartending? You can make a decent wage, cash in pocket every night. With your bartending "license", the cost of training will come back to you many times over, because you will know the tips and tricks of the industry. Oh, and there are many tips and tricks. From bartending flair to the best way to get big tips to managing the crowd, bartending training will guarantee you make the most out of your workday (or night) while still having fun, and receiving your bartending license in DC. Ready For Your Bartending "License"? 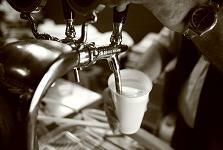 Let the Maryland Bartending Academy help you obtain a rewarding career in bartending.